This is easy widget that displays your analog or digital clock in your sidebar . Display a customizable analog or digital clock. Select your clock title, size, clock type (analog or digital skin),clock body/face flare, clock hour style, clock time property, 4 clock color (body color, face background color, clock face color, second hand color). If you already have widgets installed as part of your Wordpress installation, you can try this widget out yourself. 1. Download the clock.zip file and extract the contents. 2. Make sure you’re running WordPress version 2.8 or better. It won’t work with older versions. 3. Upload the folder to your plugins directory. 4. Activate the “clock” plugin through the ‘plugins’ page in WP. 5. See “clock” widget options to adjust things like display size, clock style and so on. The widget settings take a minute to load to due rendering all the clock on one page. If you don’t have widgets installed, head off to Automaticc’s Widgets project page and follow their extremely helpful instructions on how to install widgets and add them to your blog template. You can find lots of useful widgets via the Wordpress Widgets blog. By now, you’d think that anyone who owns a computer knows about free and open source software (FOSS). However, once you move beyond techie circles, you’ll find that, for many people, the concept is unknown. Even worse, when people have heard of it, they have alarming — and rather discouraging — misconceptions of what it involves. Technological culture is so influenced by business logic that most of us believe that “you get what you pay for” is common sense. However, when you only look at proprietary software, that adage isn’t true. If price really reflects quality, then Adobe Creative Suite would be six times better than Xara Xtreme. By the same logic, you can’t judge FOSS by the fact that the price is usually either gratis or nominal to cover shipping. In fact, since FOSS like Bind or Apache is running much of the Internet, you have to conclude that at least some of it is high-quality indeed. But, really, you can’t judge any software in any meaningful way until you’ve tried it. This idea may have had some truth twenty years ago, when FOSS was just getting started, and needed a lot of development to catch up with existing proprietary programs. And you can still find areas today, like OCR scanning, where FOSS is inferior in functionality or usability to its proprietary equivalents. However, if you compare the most common programs — for instance, Firefox to Internet Explorer, or OpenOffice.org to MS Office — the idea quickly becomes indefensible. While you can quibble over a feature here or there, in general, the leading FOSS programs are a close match for their proprietary equivalents. Actually, since FOSS licenses permit copying and redistribution, the concept of piracy is irrelevant to it. You can’t pirate what the copyright holder encourages you to give away. Moreover, when the few restrictions to copying in FOSS licensing are violated, such as the preservation of the original creator’s credit, many holders of FOSS copyright are prosecuting the violators as fiercely as proprietary software vendors do pirates. For instances, the Busybox project has brought legal action against several violators of its license in the last year. True, many FOSS supporters would like to see a world where proprietary software doesn’t exist, so you can easily imagine that some might use that ideal as an excuse to ignore proprietary licenses. But since most FOSS supporters either use proprietary software reluctantly or refuse to use it all, such cases are hardly the norm. Selling support and related services is how many FOSS-based companies like Red Hat make a profit. But, even if you don’t want to pay for support, most FOSS has mail forums in which you can receive free help — often as quickly as you can from a commercial company. If anything, the problem is not getting help so much as being deluged by suggestions from helpful volunteers. FOSS has always been centered on developers, who invented it and continue to sustain it. Especially in the early history of FOSS, this orientation meant that little attention was paid to usability. But, as the popularity of FOSS has spread, artists, technical writers, and usability experts have also been attracted to the community. For the last decade now, usability has been an important aspect of FOSS development, and now the leading programs are as easy to use as the leading proprietary ones. As FOSS continues to spread, the attention to usability can only increase. Recently, for example, Mark Shuttleworth, the leader of the Ubuntu distribution of GNU/Linux, has challenged project members to exceed OS X in usability in the coming years. FOSS developers have inherited the Unix preference for small programs of limited functionality. And it is true that several large FOSS projects, such as OpenOffice.org and Java, were developed privately and later had the code released. All the same, FOSS has no shortage of large-scale projects, ranging from the GIMP, a PhotoShop equivalent to Scribus, a desktop publishing program, and Inkscape, a vector graphics program. Desktops like Xfce are even larger projects, while GNU/Linux distributions like Ubuntu are larger yet, involving thousands of applications. Such examples make clear that FOSS is perfectly capable of scaling as necessary. For those new to security, the idea that the best way to keep something safe is to hide it. This idea is known by experts as security through obscurity, and is generally discredited. Probably the greatest reason that security through obscurity doesn’t work when it comes to code is that, if security is breached, you have no way of knowing what has happened. By contrast, if the code is open to anyone to read, then the odds are that the insecure elements will be detected and corrected. Since what you want to protect is the information, not the technique used to protect it, according to most security experts, FOSS tends to be more secure than proprietary software. Of course, because bug detection is public, detractors can say that FOSS is buggier than proprietary software. However, because we have no way of knowing how many bugs in proprietary software go unfixed or unnoticed, the number of reported bugs is not a reliable measure of security. When FOSS got strongly under way in the 1990s, proprietary software had almost two decades’ head start. Under these conditions, for a long time, FOSS development focused on catching up with proprietary software. Also, the standards for usability were developed for proprietary software, so FOSS often seemed to be imitating its rivals, especially since one school of thought held that, to attract users, FOSS needed to resemble as closely as possible what users were familiar with. Yet, even while the goal was equivalent functionality, FOSS never lacked for innovation. Both the GNOME and KDE desktops, for example, allow a degree of customization unheard of on the Windows desktop, to say nothing of standard features such as virtual desktops. And now, with the release of KDE 4.1, some developers maintain that the FOSS desktop has surpassed proprietary ones, and is now setting the pace for innovation. Similarly, FOSS has caused a revolution in business, showing that companies can be successful by selling services rather the software itself. You might say that the very idea of FOSS is a major innovation — to say nothing of the communal organization in which FOSS development takes place. The truth is, proprietary licenses restrict users far more than any FOSS license. If you read the typical end-user license agreement closely, you find that you don’t even own the software that you buy. What you have purchased is a license to use, and that license severely limits the number of computers you can install it on and your ability to work with the code. By contrast, FOSS licenses give you a right to the source code and to use it more or less how you want. Such restrictions as they include, such as preserving copyright notices, fall upon distributors more than users. BSD-style licenses are so permissive that you can even incorporate the code into proprietary code. Copyleft licenses are more restrictive, in that they insist that, if you distribute the software, you do so without changing the license. However, that restriction simply means that you pass along the same rights that you have in the software to anyone who receives a copy from you. Compared to proprietary licenses’ terms, this is a minor restriction, and justified by the theory that the only way to ensure your own freedom is to ensure everybody’s freedom. The fact that FOSS is often free for the downloading is often what attracts people to it. However, if the lack of cost was a primary motivation for using FOSS, then it would probably be no more popular than shareware. Those who stay with FOSS usually do so for one of two reasons. For free software supporters, the reason is that they wish to control their computers and what they do with them, rather than allowing a company to exercise that control. For open source supporters, the reason is that freely available source code is an extension of the academic free exchange of ideas, which they believe results in better quality software. In both these cases, it is idealism, not price, that makes FOSS attractive. Anything said often enough takes on a life of its own. And, because FOSS is relatively unknown and is different from the proprietary norm, it is likely to continue to attract rumors and half-truths. For these reasons, while the myths above are easy to debunk, I don’t imagine that doing so will greatly slow their circulation — nor stop other misconceptions in the future. Perhaps, though, by answering these myths when you encounter them, you can clear the way for the greatest argument of all — sitting the users of proprietary software down with FOSS to try it for themselves. mon.itor.us – widget for WordPress. mon.itor.us – free website and web server monitoring service allows to monitor your website performance and availability. 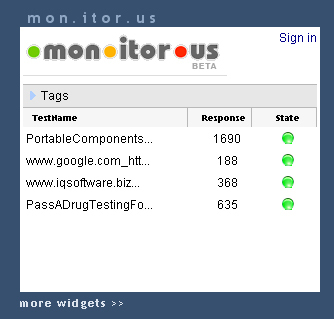 Add your tests at mon.itor.us site and view the latest state of real time monitored sites via Snapshot. Widget for this one you can download here. Open Source Initiative : All about Open Source Software Entries (RSS) and Comments (RSS).